If you are without a heated greenhouse and you want to get off to an early start, you can sow your rocket seed indoors. They will grow quickly, so you may wish to skip sowing them into seed trays and plant them directly into small pots or compartmentalized packs. Just make sure that you use containers that are large enough for the young plants to reach garden size without the need for potting on. Fill your tray or container with John Innes seed and potting mix to within a half-inch of the rim, tapping them on the side to help settle the mix. Top up as necessary. If using pots or cells, place a few rocket seeds into each one, then give a light covering of compost, firming it down gently over the seeds. If you are using a seed tray then give a light and even sprinkling of seeds across the whole tray at approximately 5 seeds per square inch. Once done, give a light covering of compost and water in. Label with the variety and date of sowing, and place in into a covered propagator making sure the vents are fully open. Now leave in a bright, warm room, out of direct sunlight. The more light the rocket seed can receive the better germination you will get. 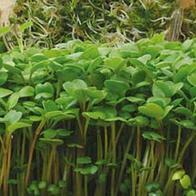 Once the seedlings reach about 2 inches in height, thin out and discard any that look weak. Those in the seed tray can be pricked out and potted on into a standard potting mix. Those already in pots can be hardened off in preparation for moving outside. If your rocket were grown under glass then they will also need to harden off before going outdoors. Place them into a cold-frame but keep the lid closed for a couple of weeks. Afterwards the lid can be opened on dry frost free days but remember to shut it again at night. After a further week or so, or when frosts are no longer expected, leave the lid open day and night for a week before planting outside. To harden off rocket seedlings that have been grown indoors in a heated room, moved them to a bright unheated room, leaving them there for a couple of weeks before either putting them into a cold frame, or for leaving them outside during the day. Never leave them out overnight, and keep them in if there are strong cold winds of if temperatures drop below 6 degree Celsius. Keep this up for a week and if there is no immediate threat of further frosts they can be planted outside. Rocket plants require a free draining, humus rich soil that will hold plenty of moisture in the summer. In preparation to sowing, dig over the soil and add plenty of compost (such as leaf mould or well rotted manure) during the autumn or early winter. Then a week or so before sowing your lettuce seeds, rake the soil over to produce a fine tilth. You may also wish to apply a general fertiliser at this time. Although rocket plants like plenty of light they do not like extremes of heat. Although your early seeded plants should be fine it's advisable to plant your summer harvest in a lightly shaded site. 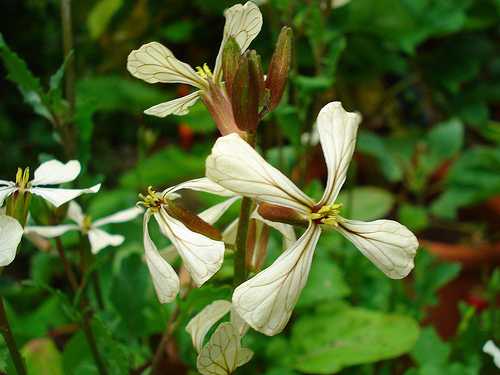 When sowing rocket seeds directly outside, wait until the worst of the frosts are over. Choose a sunny site but by sowing this early you may need to give them the protection of a small poly-tunnel. If you are starting them off into seed beds, sow the seeds very thinly in ½ inch deep drills but leave about 6 inches between each row. If you are sowing them directly into the open ground then leave between 10 and 12 inches between rows. 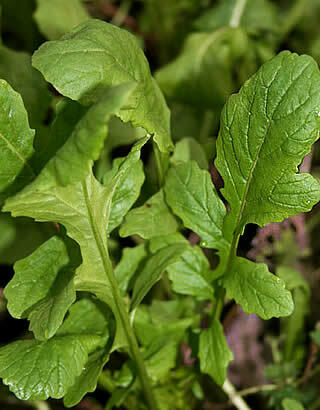 To avoid having a glut of rocket and to ensure that crops are regularly coming into harvest, make successive, smaller sowings of rocket seeds, at 1 or 2 week intervals depending on how much you intend on using. Depending on the variety it can take any time between 6 and 14 weeks from sowings to become ready for harvest, so if you are growing from packet seeds - always read the label. Once the seedlings get to about 2 inches high they can be thinned out to leave a gap of about 6 to 12 inches between each plant- depending on the overall size of the variety grown. If you are planning on transplanting seedlings grown indoors into open ground then this is an ideal time to do this.